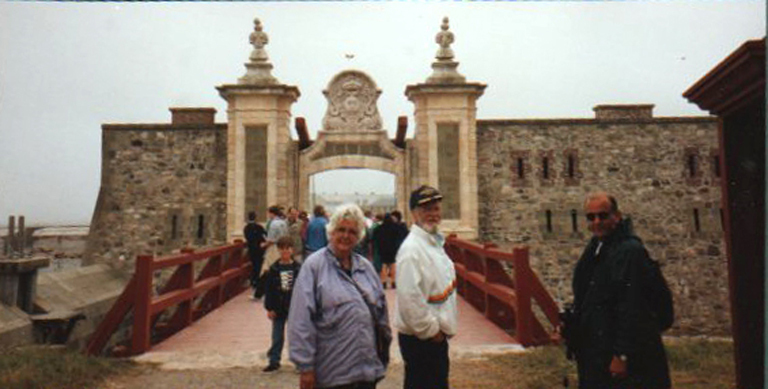 The fortress of Louisbourgh, a National Historic Site Of Canada, was founded in 1713, three hundred years ago. It is a very interesting place to visit. It takes you back in time to a much simpler way of life in the 18th Century. It changed hands a few times between the French and the English, and eventually was destroyed. Now the Government of Nova Scotia has restored about a quarter of the original and I think there are plans to restore more of the original location. 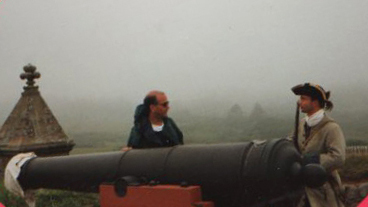 The Fortress is a re enactment of life in those days… with costumed staff, living as they did back in the 1700s. They grew gardens, but still had to import some of the essentials of life. We ate in the cafe, and I can’t remember which of the utensils was missing… but they didn’t have them in those days. When one of the guards asked Ra where he was from, Ra answered “Vancouver”… and he said “No such place”! While we were there a CBC crew were filming an actor in one of the gardens. From the Fortress we went into Sidney where we had a nice suite. We went back again the next day. Ra got permission to drive us right onto the site to save his dad and I the long walk from the parking lot to the entrance. Even two days was not enough to explore every part of this great site, but we had to move on as there was still a lot of places waiting for us to visit! Exciting! It would be great if you would fill us in on just what you saw at the fortress. Hi, WS. If you check out the two sites mentioned in Carol’s comment, you will get an idea of what we saw. You must remember that we were there in 1995…23 years ago… and I am writing this from memory…. I have no notes. I did keep a journal, but it got lost, and we took video films, but they got covered over on the tape by mistake. Thanks for stopping by. I do appreciate your visits. oops! That was 18 years ago! Not 23! Hi Carol, Thanks for sharing the two sites for the Fortress. Great. Hi Heather, I think you should go back there for a holiday. It’s beautiful (as is BC!) Thanks for coming by!